As July 4th nears, eye doctors at Outlook Eyecare in Princeton, NJ join the American Academy of Ophthalmology to raise awareness of fireworks-related eye injuries. Eye doctors in Princeton, NJ say misconceptions surrounding consumer fireworks lead to thousands of eye injuries on the Fourth of July. Eye injuries caused by fireworks have more than doubled in recent years, and Outlook Eyecare (http://www.outlookeyecare.com), a group of eye doctors with locations in Princeton, Monroe Township, and the Hamilton, New Jersey area, is joining the American Academy of Ophthalmology (AAO) to highlight the dangers posed by this Independence Day tradition. "The last place you want to be on the Fourth of July is in an emergency room getting treated – or worse, having your child treated – for an eye injury caused by fireworks," says Dr. Wayne Grabowski, one of the leading eye care specialists in the tri-state area and founder of Outlook Eyecare. 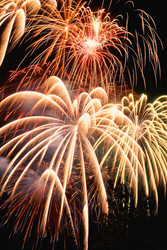 "To help prevent these injuries, our practice and the ophthalmology academy are getting the word out about common misconceptions regarding fireworks." On its website, the AAO cites the most recent fireworks injury report from the U.S. Consumer Product Safety Commission, which said that an estimated 10,500 Americans visited the emergency room for fireworks injuries in 2014. Of those, 1,300 were eye injuries, a sharp increase from the 600 reported in 2011. The ophthalmologist says the safest way to celebrate is to attend professional fireworks shows in Hamilton and throughout Mercer County. For example, Hamilton Township is opening Independence Day weekend with a concert and fireworks show on July 1 at Veterans Park, and there are Fourth of July festivities planned at the East Brunswick Community Arts Center. "Gathering with friends and family for a picnic and concert on the Fourth of July is a wonderful American tradition," Dr. Grabowski says. "Plus, you'll be treated to a spectacular fireworks show -- staged by professionals." If members of the community do choose to set off their own fireworks, Dr. Grabowski says it's important to be educated about how to do it properly, which he also addressed in a blog post. In that post, Outlook Eyecare says that sparklers should not be given to children because they are the most common source of injury in children under 5. The practice also says that all participants should have protective eyewear, including bystanders, and that unexploded fireworks should be left alone. Dr. Grabowski, whose Princeton-based ophthalmology practice also has an office in Monroe Township, says anyone who does suffer an eye injury should seek emergency medical care and avoid rubbing or rinsing the eye or applying pressure. If an object is in the eye, Dr. Grabowski advises that the patient leave it in place until a doctor can examine it. Dr. Grabowski also advises against applying any ointments. "We want everyone to enjoy an injury-free Fourth of July," he says. "I urge New Jersey residents to take advantage of one of the many professional firework displays planned for the weekend." Outlook Eyecare (http://www.outlookeyecare.com) is a full-service eye care center offering top-quality, comprehensive services for patients from Monroe Township, Princeton, and Mercerville, New Jersey, as well as the surrounding communities. The 3 Outlook Eyecare locations are staffed by a carefully assembled team of eye care professionals, all of whom are at the top of their fields and highly esteemed in the medical community. As a result of the specialized training each of the doctors has achieved, Outlook Eyecare is able to meet a full range of eye care needs — vision, medical, surgical, and cosmetic — from the most basic to the most complex.